In this work we present the application of a 3D numerical method of heat conduction for the determination and characterization of subsurface defects in material. The numerical model is based on the finite elements method. The object of this study is to investigate, the influence of position of defect in the structure and the thickness of this later on the thermal response. Some configurations are simulated in which we have taken defects in form of cylinders containing air placed at different positions. In this case twelve artificial cylindrical defects were taken and are machined in a steel metal specimen. A heat source is applied to the input surface of metal. The thermal interaction of defects on the material surface temperature was analyzed and its influence on the current contrast determined with the aim to recognize the possible determination of defect geometry and its position.
) or without contact (infrared thermography, acoustic detection...). The static methods are more sensitive to the losses by radiation than the dynamic methods. 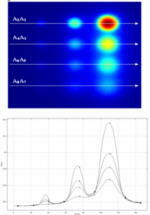 The optical methods are very sensitive to the surface quality of the sample. Among all these existing control methods, we chose to study thermal method "TNDT" , , ,  resting on detection of a possible disturbance of the thermal field which appears when in the structure to be inspected is induced a permanent or transitory heating. The disturbance is due to a local or total deterioration of the thermal properties relating to the nominal distribution. This deterioration can be the fruit of a physico-chemical modification of one of the components (effect of ageing), or the consequence of the appearance of a foreign body: inclusion  introduced accidentally, separation  or delamination ,  associated to appearance of a chink. In order to illustrate the application of the TNDT method we present the results of the non destructive testing of a standard sample (steel metal) (fig.1) of thickness e = 20 mm, length L = 156mm, and width l=146mm, containing 12 equidistant defects in honeycomb. The defects have a cylindrical form of diameter d = 9, 18 and 36 mm, height h = 15, 17, 18 and 19 mm, located at the position l1 = 1, 2, 3, and 5 mm from the entry face (fig.2). Lines A2A, A4A3, A6A5, A8A7, B2B1, B4B3, B6B5, pass respectively by the points of co-ordinates (31,0,0), (31,146,0) , (62,0,0), (62,146,0) , (93,0,0), (93,146,0) , (104,0,0), (104,146,0) . (156,36.5,0), (0,36.5,0) , (156,73,0), (0,73,0) , (156,109.5,0), (0,109.5,0) . The matter absence (and a fortiori of honeycomb) constitutes a thermal barrier. We start by building the variational form of the equation (1). We carry out a spatial discretization which consists in calculating the elementary integrals by using the finite elements and a temporal discretization. There are many specialized software which makes it possible to implement the resolution method of problems by finite elements in a more or less simple and convivial way. They take care in particular of the grid of the studied object, of the automatic classification of the elements and the nodes, of the calculation of a solution then of the graphical representation of results. The use of FEMLAB software, based on the finite element method , , makes it possible at any moment to calculate the evolution of temperature and in any point of material. The material is considered isotropic. The calculation of the thermal response is made in the case of a delaminated plate ,  subjected to uniform step function of flow on the surface on the front face, of intensity Q=1000 W. The back face being maintained at a constant temperature Ta= 25°C, the others faces are insulated (Q=0) (fig.3). The initial temperature is of T0=25 °C, near to the ambient temperature. We present the whole wall to emphasize the grid density around the defect (fig. 4). We chose a grid made up of triangular elements. 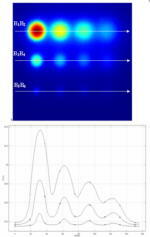 Its density increases when one is around the defects (fig. 4). The latter is simply simulated by an absence of matter. In order to illustrate the previous theoretical considerations, we present the computation results of the thermal response in the case of an isotropic material, steel in this case, characterized by K = 58W/m.k (thermal conductivity) = 7800kg/m3 (density) and C = 460J/kg.k (specific heat) containing delamination characterized by K = 0,0272W/m.k (thermal conductivity) r = 1,057kg/m3 (density) and C = 717,8J/kg.k (specific heat). The diameters d of the defects are equal to 9, 18, and 36mm and the positions of the front face l1 are equal to 1, 2, 3, and 5mm. 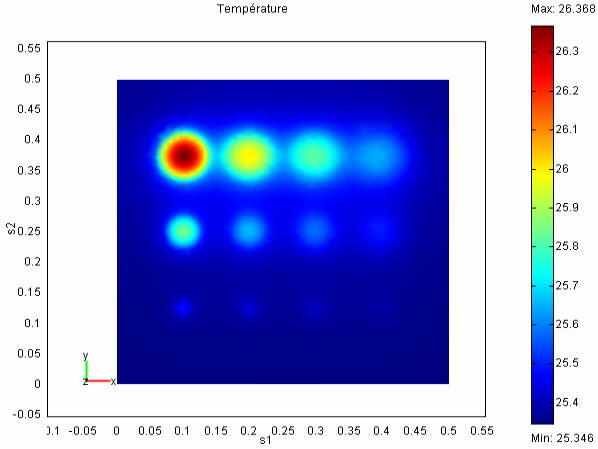 After resolution of the considered problem, it is possible to plot the temperature distribution on all or a part of the wall at a given moment, as well as the temporal evolution of the temperature in a given point (fig. 5). In the presence of the defect the heat flow has tendency to propagate by avoiding the defect as showed in figures 5 and 6. This phenomenon explains the rise of the temperature at the place of the defect, represented by a hot thermal patch fig. 5 and 6. The maximum of this temperature gives an estimate on the required resolution of the non destructive testing equipment. At the exit of the defect the flow lines tend to be uniform. This could be information on the form and the position of the defect in material. Let us interest in the influence of paramount parameters, namely the defect diameter d, and defect position l1. In this study, we consider the case of delamination with the following thermophysical characteristics: K = 0,0272W/m.k (thermal conductivity) = 1,057kg/m3 (density) and C = 717,8J/kg.k (specific heat), and located at depths l1 of 1, 2, 3, and 5mm of the front face. The curve of fig. 7 represents the evolution of the temperature profile of the entry surface (front face), according to y along lines A2A1, A4A3, A6A5, A8A7, for varying values of d from 9 mm to 36 mm with the following progressions: 9 mm, 18 mm, and 36 mm. The defects are placed at depths l1 of 1, 2, 3, and 5mm of the front face. In general a temperature higher than the average, at the entry, reveals the presence of a resistive defect in the structure. The agreement between these results and those already obtained by using a code of finite volumes , , permits to validate thermal calculation. The deformation at defect entry increases with the value of the diameter and decreases when the position increases. One can see that the temperature passes by a maximum in the case of resistive defect (fig. 7). This maximum represents the point with the top of the center of defect where it is more effective or optimal to make control. It is the point to which the maximum of temperature difference T for the defect detection appears. While moving away from the defect the surface temperature tends towards a constant value (fig. 7). The curves, fig. 7, show that the temperature profile T is strongly related to the diameter of the defect. A great value of T would result from a large diameter of the defect (fig. 7). In this case, the detection of the defect presence would be simple. With the help of adapted equipment, and in the contrary case, it is necessary to have very sensitive equipment. The curves, fig. 8, represent the entry surface temperature profile evolution (front face), according to x along lines B2B1, B4B3, B6B5, B8B7. To study the influence of the position, we calculated the response of the sample with defects whose thermophysical characteristics are: K = 0,0272W/m.k (thermal conductivity) r = 1,057kg/m3 (density) and C = 717,8J/kg.k (specific heat) and of diameter d varying from 9 to 36 with the following progressions: 9mm, 18mm, 36mm, for values of l1 varying from 1 (defect close to the entry surface) to 5mm. On the curves of profile evolution according to x (fig. 10), one realizes that one tends progressively towards a limit as one approach the case of a surface defect (l1>5mm). This case, of course unfavorable for the NDT, constitutes the lower limit of detectability of defects. The deformation at the defect location increases when the value of the position decreases. On the other hand, one can notice that the form of these profiles is different from that obtained previously. In this work, we studied the case of a material containing a cylindrical delamination subjected to a thermal stress. We carried out a systematic study of the temperature evolution according to the intrinsic thermophysical characteristics of the defect. This enabled us to conclude that, on the assumption of the less deep defects, diameter and position play a determining role in the thermal response of delaminated material. By studying the influence of the defect parameters on the measurable magnitude, we showed that it is theoretically possible to detect any defect, with the proviso of applying a sufficient energy of excitation and that of the defect, it is different in practice. Indeed, this model relates to a resistive defect in a rigorously plane plate. However, if one introduces a light initial curve (what is practically always the case in reality), one realizes that the heat gradient which exists between the heated face and the back face is at the origin of a total deformation of the plate which can completely occult the deformation at the location of defect. This phenomenon which is very often observed while a measurement makes that it very difficult to detect the defects whose diameter is very low. All calculations were carried out in the case of an isotropic material, but the taking into account of the anisotropy would be possible with the proviso of using a computer code which allows it. J.WILLIAMS-S.MANSOURI-S.LEE ''One dimensional analysis of thermal Non destructive Detection of delamination and inclusion flows'', Br. J. NDT 113-118, May 1980. A. Obbadi, S. Belattar, M. Beihaqi, A. Tmiri, A. Ballouti "Two-dimensional Analysis of Thermal non Destructive Evaluation, by the numerical method of control volumes" IV International workshop- Advances in signal processing for Nondestructive Evaluation of Materials, X.P.V. Maldague, Technical Editor ASNT Volume 6 p 195-200, Canada August 2001. A.Obbadi, S. Belattar, S.Sahnoun, A. Tmiri "Analyse numérique des profils de température et de flux: application au contrôle non destructif" Journal PCN (Physical & Chemical News) volume2, Numéro2, p49-53, 2001. R. Abou Khachfe, "Résolution numérique de problème inverses 2D non linéaires de conduction de la chaleur par la méthode des éléments finis et l'algorithme du gradient conjugué - validation expérimentale" thèse de doctorat de l'université de Nantes France 2000.